This young adventurer is very excited for her European tour. She just needs to find convenient but still trendy clothes for this voyage. Akila is a lover of fashion, travel, and turquoise. Create a look borrowing from ancient Egypt with a modern twist. This playful Eskimo is very happy of our visit. He wants us to explore the northern fashion. 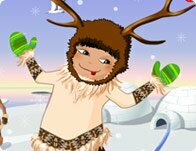 Try on the beautiful furs and some warm mukluks. 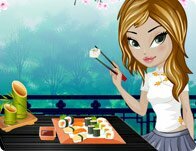 In order to appreciate her sushi experience to the maximum, our gal is looking for a fun outfit. Research for her a tasteful look. Create a fantastic safari outfit for this young traveler. Don't forget the camera! In this heavenly photo-shoot scene, choose clothing and accessories that will promote the new summer collection of this Filipino designer.